For residents of the Moss Park community housing project, accessing healthy, affordable food isn't a viable option. That's about to change. Image from Building Roots TO. Standing in the small parking lot in Moss Park, there are four Toronto Community Housing high rises within eyeshot. The towers are home to about 2,900 low income residents, many of whom struggle to feed themselves and their families everyday—healthy food is simply too expensive and difficult to access. But that’s about to change. Within a few months, the parking lot at Queen and Seaton will feature a shipping container full of local and exotic produce, far cheaper than anything you’ll find at a farmer’s market or grocery store. The Moss Park Market, a two-year pilot project, is a collaboration between local TCHC residents and Building Roots, an urban agriculture initiative Lisa Kates and Darcy Higgins started two years ago as a way to ensure food security and food literacy across the city. Kates and Higgins, both long-time food accessibility advocates, teamed up to figure out how to incorporate food access into new and old housing developments, particularly those in low income and tower communities. So far, their work has helped create community kitchens, pop-up markets, and urban farms in underserved neighbourhoods. After learning about their work, Dennis Hawkins, a TCHC resident in Moss Park and community team leader for his building, reached out to Building Roots to seek a solution to the community’s food insecurity. Right now, the closest grocery store to Moss Park is a 15 minute walk. It may not sound that far, but for elderly residents and those with mobility challenges, it’s a significant barrier to accessing healthy food. Hawkins, who spearheaded the Moss Park community garden back in 2011, pitched the idea of a getting a permanent market on the building premises last summer. “They were all into it,” he says, referring to the tenants and the housing provider. And the situation isn’t expected to improve any time soon. The University of Guelph’s Food Price Report [PDF] released late last year estimates that food prices will rise 4.5 per cent this year, after increasing 4 per cent in 2015. It’s a blow to any consumer’s pocket book, but for low income residents, it can mean the difference between having a meal or going hungry. After speaking with the Moss Park residents, it was clear to Kates and Higgins just how high the community’s need was. “There’s nothing really happening here. They don’t get much support from the City or from the Province,” Higgins says, comparing Moss Park to Regent Park, the neighbouring social housing community that’s in its third phase and tenth year of a revitalization project. “There are restaurants and nice parks there—this has just remained the same,” he says. A few blocks northeast of the soon-to-be shipping container market, there’s a little shack stocked with fresh fruits and vegetables at prices apparently untouched by the dramatic rise in food costs. A head of cauliflower is $1.25, three English cucumbers is $2, and two bags of snow peas is $1. Arman Farmer’s Market has been a fixture in Regent Park since Wali Barak opened the produce shack 16 years ago, long before revitalization took hold. “We are so lucky,” one woman says as she purchases her order, grateful for the budget bounty. Hawkins has recruited Barak to bring a similar model to the residents of Moss Park—some of whom are already loyal customers, making the extra trek for Barak’s affordable and culturally diverse food selection. Barak is able to keep his prices low through a long-standing relationship with Burnac Produce Limited, and by having very little overhead (he picks up and unloads his own shipments, and has no employees or rent to cover). 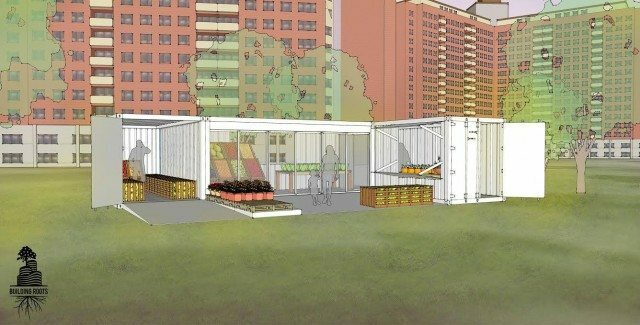 The Moss Park shipping container will be slightly more high-end than Barak’s plywood shed—complete with heating, air conditioning, and an accessibility ramp—but the cost of food will remain low. TCHC is supplying the space and hooking it up with heat and hydro, and Building Roots has forged partnerships in the community to cover the $30,000 cost for the container itself. They’ve received funding from the Ontario Trillium Foundation, Mitchell Cohen, the CEO of development company Daniels Corporation, and Storstac, the company providing the shipping container. The market is expected to be up and running in April, and will be open three days a week, 12 months a year. “People at the City and Toronto Community Housing are interested already in replicating this,” says Kates.